Players signing up to an online poker site via the media hub at PokerTube.com can look forward to a special Christmas gift courtesy of Santa's Sack. All sign ups to a new site will receive tokens for the PokerTube slot machine with free poker money, PokerTube t-shirts, extra spins, an exclusive 2015 calendar featuring photos of PokerTube host Natasha Sandhu and cold, hard cash to be won courtesy. Players will have 12 online poker sites to choose from with PokerTube set to award thousands of dollars in prizes during the promotion. "Christmas is a time for giving, and we wanted to give something back to our community of loyal players," said Jamie Nevin, founder of PokerTube parent company 180Vita. "With freebies on offer just for signing up to an online poker site through PokerTube, we are sure there will be plenty of Christmas cheer to go around." 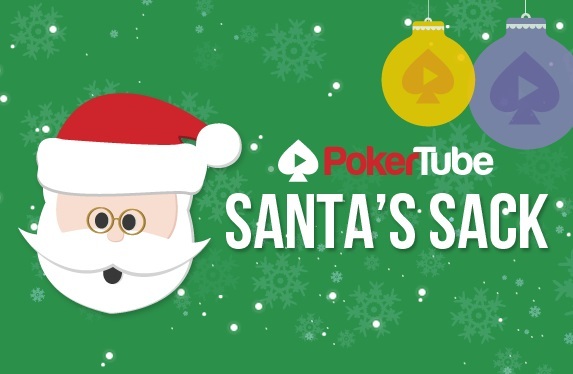 The Santa's Sack promotion comes hot on the heels of PokerTube's sister site PokerVIP.com launching its Winter Miracle giveaway, which is paying out a record $210,000 and includes some of the largest rake races ever.